At that time, the events were real and not manufactured. Things eventually were reconciled and animal services regrouped, a new director took over in 2017. Then in 2018, animal control cases were transferred from Judge Tom Coleman's County Court to the County Special Magistrate, where cases are regularly heard. 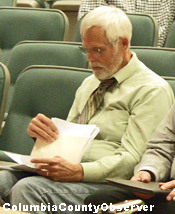 Tom Barritt prepares to address the County 5 in March, 2018. In March 2018, the Humane Society's new Director, Tom Barritt and the Lake City Reporter's Robert Bridges appeared at the County 5 for the first time at the same meeting. Now, one year later, Animal Control and Mr. Bridges are both back at the County 5 for the first time since then. The majority of Animal Control cases appearing before the Special Magistrate are loose dogs and harassing dogs. The cases have been adjudicated by Magistrate Vernon Douglas without incident. Everything has been under control. 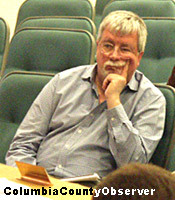 Robert Bridges at the March 2018 meeting. On Thursday, March 14, 2019, an innocuous item appeared on the County 5 agenda for the March 21 meeting: "Animal Control – Aggressive Dogs." The stated purpose of the item was clear and unambiguous: "Have a discussion of what can be done to provide animal control with necessary tools to stop aggressive dogs." The item was recommended by Commissioner Nash's concerns and he was seeking "input and direction." The Lake City Reporter's hound-dog-in-chief, Robert Bridges, got a whiff of this and sent cub reporter Carl McKinney on the hunt. On Tuesday, March 19, the LCR ran the headline: "EVEN IF NOBODY WAS BITTEN 'Aggressive' dogs could be taken at will, under new plan." The article warned: "Canine community members better watch their bark as much as their bite, if a proposal from the county's animal control chief can pass legal and political muster." The hysterical article attributed Animal Control Director Dale Griffin with all sorts of things, mainly claiming that Mr. Griffin wanted the "County Commission to pass an ordinance giving field enforcement officers the discretion to confiscate aggressively behaving dogs whether or not they've left the owners property or attacked anyone." "I didn't see anything in black and white." The newspaper had contacted County Attorney Joel Foreman who opined in the March 19 article that the policy purported by LCR cub reporter was problematic. The LCR quotes Mr. Foreman as saying "he'd have to do an in-depth legal analysis on Griffin's proposal if the commission wanted to move forward with it." Earlier today, Sunday, March 24, your reporter emailed Mr. Foreman asking him in relevant part, " ... did you ever see it, i.e., you were presented some kind of plan in writing? Or Did McKinney share his characterization of a purported plan by Animal Control?" Mr. Foreman responded, "He essentially told me what was being suggested (that dogs be impounded based on officer determination that animal was aggressive) and I told him that raised legal questions about going into private property and seizure of property without due process. I didn't see anything in black and white." On March 20, the day before the meeting of the County 5, the 'hometown' paper ran an editorial entitled, "Humane society plan a poor one." The newspaper reiterated its scare tactics: "Here's what they propose. When an animal control officer decides a dog looks "aggressive," the officer can enter the owner's property and take possession of the pooch. Never mind that the animal is lawfully housed on the owner's land and has broken no laws... Of all the ridiculous schemes we've seen government agencies concoct, this is one of the worst." The newspaper still had no written plan from Animal Control.